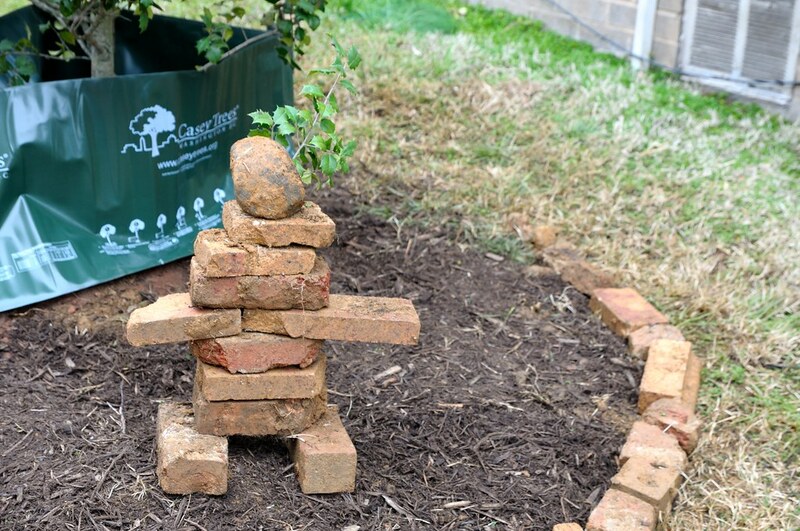 Volunteers built an inukshuk from excavated stones and bricks, inspired by veteran Citizen Forester Otis Maréchaux. 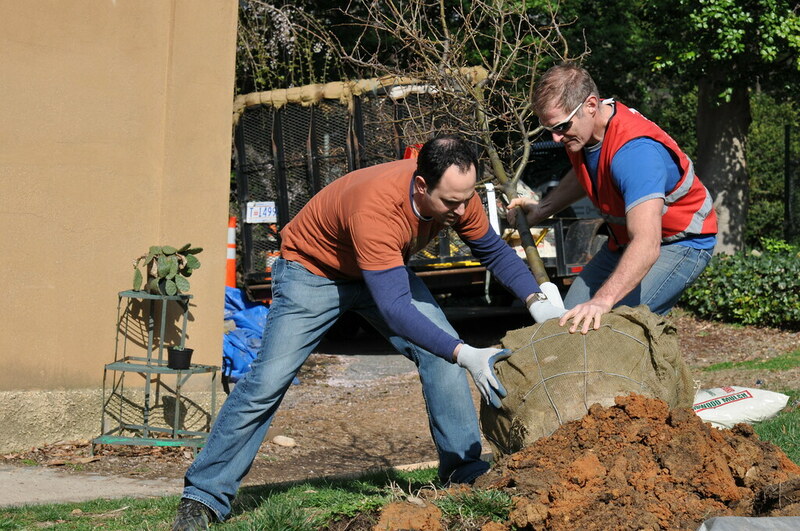 On Thursday, April 7 we planted nine trees at Tudor Place, returning after a successful larger planting last October. The grounds of this beautiful, historic home in Georgetown serve as a refuge from the bustle of the city streets. We have joined the Tudor Place organization to restore some of the property's original tree species. Deb and Jeff Nussbaum graciously sponsored this planting in honor of the birth of their child, Sophia. Among our 25 volunteers were seven boy scouts from Troop 632 in Tecumseh, Michigan who delayed their sightseeing to join our community planting. Rolling a ball and burlap tree into position at Tudor Place. On Saturday, April 9 we had a large planting of 30 trees at Columbia Heights Village, a community at the corner of 14th and Harvard Streets NW with lots of green space and a single tall ginkgo. We benefited from the efforts of 73 volunteers, including 16 Citizen Foresters. Among our volunteers were groups from the Urban Land Institute, American University's study abroad program, George Washington University's Epsilon Alpha service sorority, Washington International School plus residents and neighbors from the community. Also, Councilmember Jim Graham arrived just in time for pizza after the planting! Thanks to Earl Lee for serving as a Lead Citizen Forester and to the Columbia Heights Village Tenants Association for helping to organize the event. 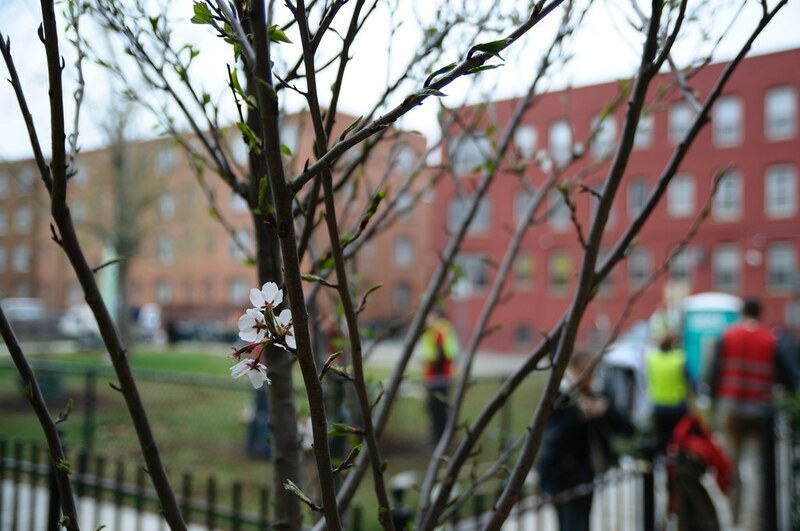 Lead Citizen Forester Earl Lee and Project Organizer Garrett Lee put together a slide show of photos and other content from the Columbia Heights planting - you should take a look! A newly planted tree at Columbia Heights Village.